The hectic December schedule was exhilarating and grueling no doubt but it has paved the round of fixtures set to take place in January with a difficult trip to Southampton coming on New Year’s Day. Arsene Wenger’s Christmas wish was probably to have his entire squad to select from but even Santa Claus couldn’t grant the gaffer such a request. Arsenal and injuries have become a bonded pair and it’s very rare seeing a season go buy without one or two long-term absentees here and there. Speaking of long-term absentees, there’s some light at the end of the Theo Walcott tunnel, as the manager stated that he’s fully fit but he’s a bit short (not based on his height) due to the fact that he hasn’t gotten enough match fitness. With Olivier Giroud still suspended and Lukas Podolski’s future uncertain, Wenger may need to summon Walcott ahead of schedule, especially with the saddening news that Danny Welbeck has picked up a thigh strain. Welbeck hasn’t been prolific in front of this season with just four goals in 16 Premier League appearances but what he lacks in composure and finishing, he gives in pace, work rate and determination. Another potential reason why Walcott hasn’t been selected has been the emergence of the Ox. This season, the young lad has really stepped up his game this season and I’m sure his manager must be proud. Elsewhere, Aaron Ramsey is still out injured following the thigh injury he suffered. Wenger intends to take a subtle approach in handle the Welsh Jesus and with Tomas Rosicky returning to fitness after resting at home, it will be great to see the Czech maestro strut his stuff. He scored a vital goal against QPR in his first start in ages. Besides, Rosicky needs a run of games in his bid to reach full fitness. The usual suspects are still out injured, but Mesut Ozil is close to returning to full fitness next month. I’d keep you updated as more news on the players as the day goes by. 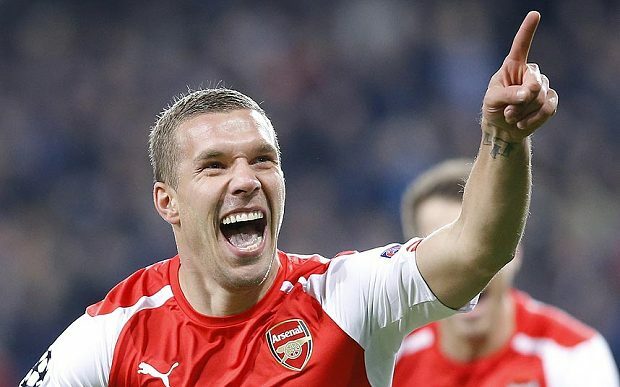 I can vividly remember how Arsenal courted Podolski in his twilight campaign with FC Cologne. It was one of the world’s best kept secrets. Arsene Wenger continued to hide info from the Press, denying if he was linked with the forward. Finally, the cat was let out of the bag and we heard that he was going to be among the highest earners at the club. With his pedigree for being a lethal finisher as well as his impressive goal to game ratio for Germany, many Arsenal fans were excited with the prospect of having such a talented individual in the club. Robin van Persie’s exit was a bitter pill to swallow but Podolski and his fellow new recruit, Olivier Giroud, combined to score 33 goals. In his second season with the club, Podolski suffered a torn hamstring that sidelined him for four months before making his comeback in December. He ended that campaign with 12 goals in 27 apps but this season, his stock fell so low and he has fallen out of favor with the manager. With the acquisitions of Alexis Sanchez and Danny Welbeck, he has also gone further down the pecking order. With the European Championships coming up this summer, Podolski won’t want to be left out from the Die Mannschaft squad with the likes of Marco Reus and Julian Draxler ahead of him in Jogi Loew’s plans. According to the Mail Online, Italian outfit, Internazionale, are bracing up to prepare a six-month loan deal for the German. Following their 2-2 draw with Lazio, the San Siro-based outfit are 11th in the Serie A table and are clearly struggling. Signing a player like Podolski would bolster their attack and his finishing prowess can be beneficial to them in the short term. There is no talk about making the deal permanent so the team has identified Podolski as a short-term fix for their current predicament. The player himself would have something to prove bearing in mind that he has been deemed not good enough in a club like Arsenal. I’d follow the situation closely and we would see how things pan out in the coming weeks.